WarningsSharp cutting edge under tear strip. Avoid contact. Microwave: 1. 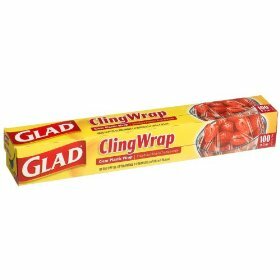 For best results, use a container that allows at least one inch of space between ClingWrap and food. 2. Turn back one corner of ClingWrap to vent. 3. Use of any plastic product with foods high in fat and sugar may cause melting. Always use caution when removing wrap from heated foods. 1. Take roll out of box and find start of roll. Return roll to box. 2. Place box on flat surface and push in tabs. 3. Pull amount of wrap needed. Tear wrap up and across. 4. Slightly stretch wrap over food or container so air does not seep in. Sargento Swiss Cheese Ultra Thin Slices.Keep cheese fresh with Fresh-Lock double zipper.Ultra thin sliced natural Swiss cheese.40 calories per slice.18 ultra thin slices.Our family's passion is Cheese. Gatorade Orange Thirst Quencher.G.80 calories per bottle.Naturally flavored with other natural flavors. Celestial Seasonings Lemon Zinger Caffeine Free Herbal Tea.100% natural teas.20 tea bags. Natural flavors. Contains no juice. Low sodium. 140 mg or less per 20 ml (8 fl oz). Caffeine content: 12 mg/8 fl. oz. ; 26 mg/16.9 fl. oz. 61 mg flavonoids per 8 fl. oz. serving. With tea flavonoids and antioxidants (vitamin C).